In a single generation, Philip II brought Macedonia from a remote, semi-barbaric kingdom, to become the master of Greece. He built up the Macedonian army into the region's greatest fighting force, and was already planning an invasion of Asia Minor when he was killed, leaving Alexander the Great, a boy of only twenty, on the throne. The death of Philip brought on rebellions throughout the Macedonian Empire, and Alexander quickly showed enormous military skill and resolve by quickly putting down all resistance. Almost immediately after consolidating power, Alexander proposed an invasion of Asia Minor, and invited his Greek subjects to commit to the endeavor. The Macedonian invasion of Persia was truly audacious, and its consequences were enormous. Alexander had only 35,000 troops to invade a wealthy empire of forty million. His troops were vastly better drilled and motivated, while the Persian government was corrupt and decadent, but the disparity in resources was astounding. The real strength of the Macedonians, however, was in cultural, as well as military superiority. In terms of political control, Alexander's Empire broke up soon after his early death, and the governments that replaced it were despotic rather than democratic. But they were all Greek in terms of language, education, and culture, and served the purpose of disseminating the Greek language, Greek literature, and Greek ideas throughout the ancient world. The Hellenistic kingdoms thus created made Greek the language of commerce and learning throughout the eastern Mediterranean, and profoundly changed the culture of the region. Before Philip died he had been planning an invasion of Persia, and Alexander spent over a year making preparations to carryout his father's plans. In 334 BC He crossed the Hellespont with only 35,000 picked men, and won his first battle at Granicus against 40,000 Ionian Greeks. Most of the cities of Asia minor put up no resistance, and he spent the next year consolidating power in the region before continuing his campaigns. In was during this period, that he famously cut the Gordian knot. Finally Darius III, gathered an enormous army of over 100,000 and marched to meet Alexander at Issus, but was defeated with great loss. A great number of his army was slain, his entire camp was overtaken, and his wife and mother were captives of Alexander. The battle of Issus put most of the old Babylonian domain, including Egypt, into Alexander's hands. The only two holdouts were Gaza and Tyre, the former of which fell quickly, and the latter of which required a year's siege and naval support before being conquered. Again Alexander spent a year in the region consolidating power, before continuing his campaign by marching east towards the Persian capital. At Gaugamela, he met Darius at the head of over 200,000 Persians, nearly five times the Macedonian army. The Macedonians however, were so far superior in arms and training, they put the entire army to rout. Darius fled with Alexander in pursuit, and was killed by his own bodyguard before Alexander could reach him. By the end of 331, Alexander was the undisputed ruler of both Greece and Persia, but still this was not enough. He spent much of the next few years exploring his eastern domains of Media, Parthia and Bactria before turning his attention to India. During his explorations he had required that local chieftains submit to his authority, but as he approached India several resisted. He finally crossed the Indus River and met the great Chieftain Porus at the battle of Hydaspes. Although Porus's army was defeated, Alexander was so impressed with his brave resistance that he appointed him Satrap of all of India. Alexander desired to push on towards the east at this point, but his army refused to go on. He returned to Babylon, and for some years reigned in peace before dying, probably of excessive drink in 323 at the age of 34. Fought May, 334 B.C., between 35,000 Macedonians, under Alexander the Great, and 40,000 Persians and Greek mercenaries, under Memnon of Rhodes, and various Persian satraps. Alexander crossed the Granicus in the face of the Persian army, leading the way himself at the head of the heavy cavalry, and having dispersed the Persian light horse, he brought up the phalanx, which fell upon and routed the Greek mercenaries. The Persians lost heavily, while the Macedonians' loss was very slight. Fought B.C. 333, between 35,000 Macedonians, under Alexander the Great, and a vast horde of Asiatics, with 30,000 Greek mercenaries, under Darius, King of Persia. The Persians were drawn up on the right bank of the Pinatas, which crosses the plain of Issus. Alexander, led his heavy cavalry to the attack on the left, crossing the river, and routing the Persian cavalry. The phalanx in the centre was opposed to the Greek mercenaries, and after heavy fighting, the Macedonians made good their footing on the right bank. Alexander meanwhile led his squadrons against the bodyguard of Darius, who fled from the field, followed by the whole of the Asiatics, and the victory was complete. This city, defended by a Persian garrison, under Batis, was besieged by Alexander the Great October, 332 B.C. Utilizing the engines he had employed against Tyre, he succeeded, after someweeks, in breaching the walls, and, after three unsuccessful assaults, carried the city by storm, the garrison being put to the sword. This strongly fortified city, built on an island separated from the mainland by a channel 1,000 yards wide, was besieged by the Macedonians under Alexander the Great, B.C., 332. Alexander at once commenced the construction of a mole across the channel but was much hampered by the Phoenician galleys, which issued from the two fortified harbours, and destroyed his military engines. He therefore collected in Sidon a fleet of 250 ships from the captured Phoenician cities, and holding the Tyrian galleys in check, completed his mole. It was some time, however, before a breach could be effected, but in August, 332, an assault was delivered, headed by Alexander in person, and the city was stormed and taken. Eight thousand Tyrians fell in the storm, and about 30,000 were sold into slavery. Fought October 31, 331 B.C., between 47,000 Macedonians under Alexander the Great, and the Persian army, three or four times as numerous, under Darius Codomannus. Alexander, who led the Macedonian right wing, forced a passage between the Persian left and centre, and attacked the centre on the flank. After a stubborn resistance, and though meanwhile the Macedonian left had been hard pressed, the Persians gave way, and Darius taking to flight, the whole army fled in confusion, and was routed with enormous loss, especially at the passage of the Lycas, which barred their retreat. This victory made Alexander master of Asia. Fought B.C. 327, between 65,000 Macedonians and 70,000 Asiatics, under Alexander the Great, and the army of the Indian king Porus, numbering 30,000 infantry, with 200 elephants and 300 war chariots. 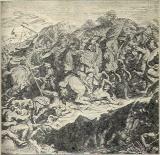 Alexander crossed the river a few miles above Porus' entrenchments, and utterly routed him, with a loss of 12,000 killed and 9,000 prisoners, including Porus himself. The Macedonians lost 1,000 only. Alexander the Great Greatest general of ancient times. Conquered Persian Empire with 40,000 soldiers. Parmenio Chief general of both Philip of Macedon and Alexander the Great. Eventually killed by Alexander. Darius III † Last king of Persia, overthrown by Alexander the Great. Memnon of Rhodes Persian satrap who met Alexander at the battle of Granicus. Porus Proud King of India, defeated by Alexander, but then restored as Satrap of the region. With an effort he looked at them as they passed.